After over two months on the market, we received a handful of testimonials and awesome feedback from dedicated guys trying to improve themselves and learn new valuable skills. Please use the "Review" button inside of each course, or send us an email at support@spigotcourse.org. Here is a selection of (many) reviews found on SpigotMC, MCMarket, YouTube, private email, reviews for courses or the Facebook group. SpigotCourse itself also offers a rating function. The course is great, it covers many parts and personally helped me a lot. It's direct and straight to the point, and "Kangarko" is going to show you the "best way" to approach a goal. 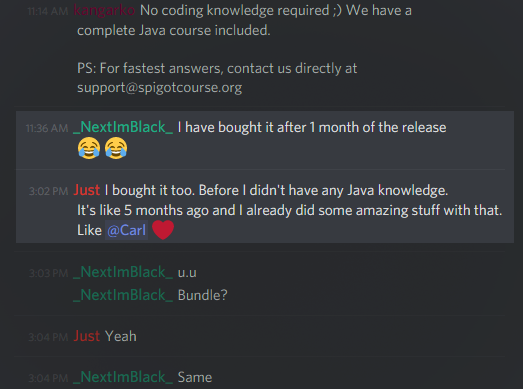 This course and its excellent support group are great resources for learning about coding software and I highly recommend this. Thanks. I have learned a lot from this course. It's really in-depth and detailed tutorial! I saw other ones but I thought this was the most promising and I don't think there will ever be a better course than this. It simplifies everything to make it just that much easier. Fantastic Tutor! 100% recommended. So far this is the best course I ever enrolled in. In a small amount of time I managed to learn so much about coding. I am only through a few lectures, but the instructor is good and seems to know what he is talking about. The course got me inspired and excited to start making minecraft plugins. Great course and I highly recommended this! 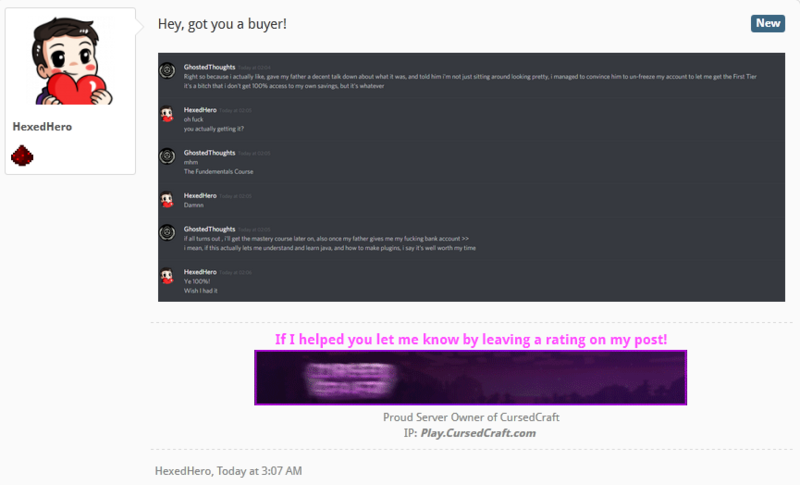 If you wonder what people say about my past work (published by the nickname of kangarko), here I decided to show what other people say about my most popular programs ChatControl, CoreArena, Boss, Confiscate and Winter. That is why I offer a FULL 30 DAY REFUND policy. If you put in the work and are not satisfied, I will send you 100% of your money back.